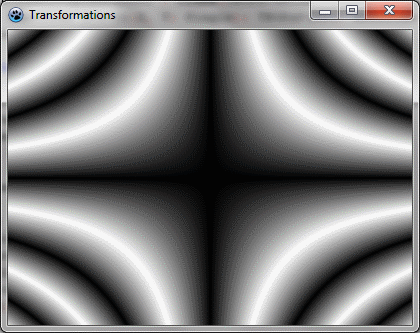 This tutorial shows how to combine transformations. Create a new project and add a reference to BGRABitmap, the same way as in the first tutorial. 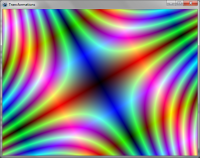 The base gradient is radial, centered at origin (0,0), of radius 1. The Fill instruction draws the result into the image. 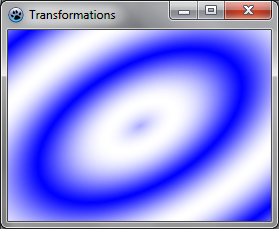 You should obtain a blue and white ellipse gradient. 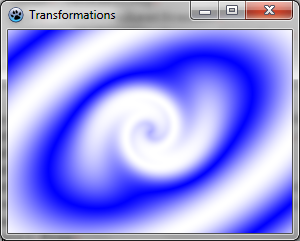 Here, we simply create a twirl transformation applied to the previous one, and fill with it. Now the center of the gradient is twirled. It is derived from TBGRACustomScanner to be used for filling, and the ScanAt function is overridden. It computes the product of both coordinates and make a cycle of 512 with it (from 0 to 255 and then from 255 down to 0). The red and blue intensities are filled with a cycle of x and y positions. This page was last modified on 1 November 2012, at 13:50.